I have a confession to make. 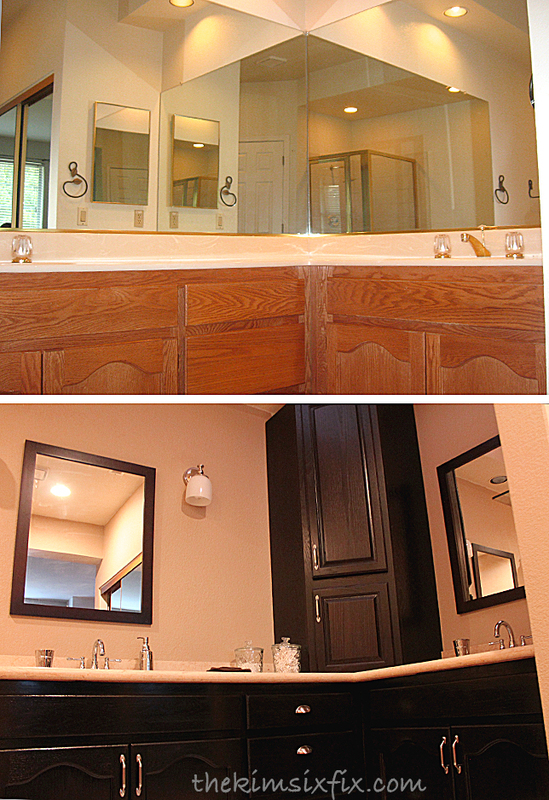 Remember when I redid my master bathroom and I installed a corner cabinet on the vanity? Remember I said I was going to install crown molding on that cabinet to finish the room? Yeah.. you probably forgot about that since it was TWO YEARS AGO. Well. I NEVER did it. 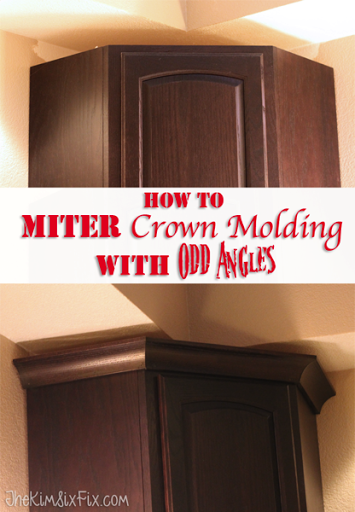 I was having a hard time figuring out how to miter the crown at the funky angles resulting from the weird cabinet shape. And I only had EXACTLY 6 feet of matching crown from the cabinet company. I was paralyzed with fear of screwing it up. That 6 foot piece of molding has been leaning against the bedroom wall for TWO FULL YEARS (#keepingitrealwithkimsix). But thanks to Kreg** I finally figure out how to do it. And it was so easy, I had to share the secret with you. First let me bring you back.. I scoured the internet for good tutorials on how to miter crown and they either required you to just “guess” the angle (and use a pizza box?! ), or they had all sorts of math I knew I would screw up (no seriously.. look at that link.. your head will EXPLODE) or they didn’t even mention odd angles since they assumed you only had 90 degree corners. I just couldn’t use any of those tutorials for this project.. and then I was looking through the gift basket I won in a Kreg giveaway and it was as if my guardian angel (or should I say “guardian angle”) was watching out for me. They had included this Crown Pro jig! Seriously ya'all.. This thing has CHANGED THE WAY I THINK ABOUT MITERS. No templates, guessing, coping, or MATH! Plus, before I used this jig, I had the additional problem that the fence on the back of my saw was too low to handle thick crown molding.. But that is no longer a problem!! Everything you need (except the saw) is included in the kit. The instructions that come with it are pretty complete, so I’ll just give you the quick and dirty overview. Step 1: Determine the install angle of your actual molding. (How “tilted” it is when it attaches to the wall.) Crown typically comes in three “Spring Angles”: 38, 45 or 52 degrees. My molding was the 52 degree variety. Step 3: Next you need the angle of the wall (or in my case cabinet) you are trying to go around. My angles were 45 degrees. And there you have it. I used my nail gun to install those suckers and I never needed to trim or recut it.. Not even once!! I actually had molding left over. THAT NEVER HAPPENS! And I will admit I am completely pumped up about doing crown on my actual ceilings in the bedrooms since this so easy. I wish I had opened the box 2 years ago! Can you believe the key to this entire process only costs about TWENTY FIVE BUCKS?!?!?!? **(No, this isn’t a sponsored post.. but I did win this awesome Crown-Pro tool in a giveaway. I'm so glad I did or I would have never discovered it!! ).